23660 Walden Center Dr #306, Estero, FL.| MLS# 218075394 | Southwest Florida Residential Real Estate for Sale. Location, location, location! Spacious Freshly Painted one bedroom one bath condo at The Tides at Pelican Landing. 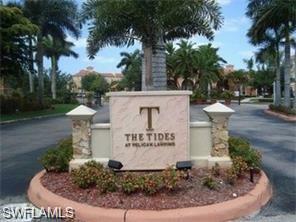 Located in back of community with views of Pelican Landing and lush tropical landscaping. Completely Tiled with granite counters in kitchen and bath. Newer appliances and stack washer and dryer in residence. Community boasts resort style pool, hot tub, fitness room and clubhouse. Gated entry and manager on site. Located near Coconut Pointe Town Center and New Bonita Health Complex. A short drive to the Beaches, Airport, Restaurants and Shopping. Well maintained condo with Assessment Paid in Full. Motivated Sellers.